Stop blaming soda for America’s bad health. Cars are the real problem. Take me, for example. I’m lazy. I eat as much yummy food as I want until I’m full. On the other hand, since I live in New York, I walk up and down four flights of stairs on a daily basis whether I like it or not (I don’t). I walk to home, work, subway, lunch…no car. But, if I lived anywhere elsewhere, I’d probably never get out of my car. My daily step count would go from 4,000 to 15. I’d have to drive through a “restaurant” to get junk food twice a day, or risk cooking food myself. My weight would double until I would not be able to walk any longer (truth be told, it wouldn’t have to double – an increase by 50% would do the trick). I’d probably start drinking and smoking. In short, my car would be killing me. What are the alternatives to owning a car? TreeHugger.com has some ideas, but nothing you didn’t already think of by yourself. The obvious answer, of course, is to live and work in New York City. Problem solved. New York, however, still allows cars (metal deathboxes on wheels) into the city itself. This is not a good idea. Cars should be banned outright. I know this is the kind of crazy talk that will have most of you solid citizens shaking your heads in disbelief, but think of heavier-than-air flight. This was considered impossible for centuries, but now look at us: whizzing around the sky, leaving “chem trails” everywhere! Cars haven’t been around for that long – we can still take the world back from them. I am hereby joining the World Car Free Day. I know it sounds pointless now…but wait. In 100 years, everyone will consider me a groundbreaking visionary. Here are three great ideas for a car-free New York City. Sink the Cars The FDR briefly dives under Gracie Mansion (where the mayor lives). On top is a lovely public park that has benches right by the East River (not actually a river at all, but a salt water tidal estuary). You can sit right by the river and throw popcorn at the lucky stiffs taking the Circle Line on a nice summer day, while the cars below you are out of sight, out of mind, toiling away in semi-darkness. Just where they should be. All of the city should be like that. Sink the roads and highways. If we can put a subway underground, we can put the cars there, too. Raise the city This idea might be a bit more costly, but hear me out. Start by thinking about Venice, 500 years ago. As the city gradually sank into the lagoon, everyone just closed up their ground floors and turned the upstairs windows into a door. The ground floor became the basement, the building got a new floor added above the roof, and voila! Back to where they started. We could do that here, too. The ground floor would now be the “car floor”. The second floor would become the main entrance (or “garden level”) for all buildings. And what an entrance it would be! Step right from the lobby onto a green park with footpaths and bike paths. In the center, the fast lane for personal wheel power. Old people whizzing along in dogsleds or self-driving electric carts. Young folk on hoverboards and one-wheel Segways. Vegans on solar-powered low-fliers augmented by peddle power. Everyone else on Citibikes and kick scooters. To the left and right, walking paths – one for busy working people who have to get somewhere, and another for tourists, family groups, and busy working people in temporary walking casts. Rows of kale, arugula, Thai basel and lavender grow in between. Trees. The subway entrances stay where they are. Now, what about the “car floor” in your building? It’s right below the “garden level”, and above the basement. Here, you’ll find the concierge desk for deliveries of goods and food (brought in by humans, personal robots, and drones). You’ll find services such as 10-minute shoulder massages, playrooms for children and pets, and virtual reality pods where you can experience total darkness and silence. You’ll find live music and whatever has replaced meeting people for coffee and a chat. Step out of the “car floor”, and you’re on a narrow sidewalk abutting a never-ending tunnel, where self-driven or remotely piloted buses and private cars can swoop in and pick you up, then continue on their way in this paved-over transportation layer under the city itself. Water Rising sea levels are going to help us a lot with this one. The expected rise of between 2 to 6 feet by the end of this century means that New York is already looking at very expensive sea defenses: sea walls, sea barriers, subway condoms, etc. Why not just go with it? Fill the lower levels of all buildings below 23rd street with waterproof concrete to stabilize them. Let the ocean rise, until at about 5 feet, voila! Canals! Gondolas, jet skis, peddle boats, sailboats, motorized vaporettos will be whizzing us from downtown to the docks in Chelsea and all along the Hudson and East River. As the oceans rise, the canals can extend until City of Water Day is every day. Large floating platforms – open air in summer, closed in winter – will house restaurants, bars, clubs, theaters, and fly-fishing classes. High-strength flexible temporary walkways will extend between windows in the upper floors of buildings, creating an ever-changing highway in the air. You’ll be able to walk from 60 Wall Street, 30th floor, all the way to Central Park. During storms, the walkways are reeled in and the windows close up until conditions improve. This is kind of fun, your post, but what really caught my attention is the misnomer about the East River. What is a salt water tidal estuary? What would be an appropriate name for the ER, then; would it be akin to the E Delta?, or the Hudson Estuary? It’d be cool to see a post related to New York’s waters. 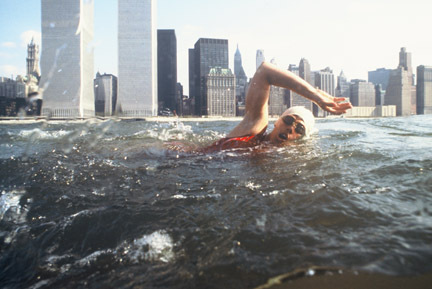 I know that Diana Nyad swam around Manhattan in the 80s, and that NY is a major port city (Vancouver may actually have more traffic, but I don’t remember correctly right now). There are turtles that nest on the beaches of Brooklyn (there’s a great New Yorker story on this) – I bet there’s a ton of cool stuff (like the gondola near the 55th St tunnel) that would fit into a post of that nature. No, the Bronx? I will have to look into that. And I would never imply the other boroughs are not integral parts of the city (Staten Island maybe not so much?). As a longtime spouse of a Bronx Boy, I could not get away with that. I’ll blog more about the other boroughs, because I love them too. But are you sure about the Bronx and obesity? Maybe the most obese urban county …but I’m pretty sure Mississippi wins the gold for USA as a whole.